Described as a text that will touch the heart of every person in our society, the Australian Catholic Bishops’ 2016-2017 Social Justice Statement has been launched locally in Perth by Auxiliary Bishop Don Sproxton. 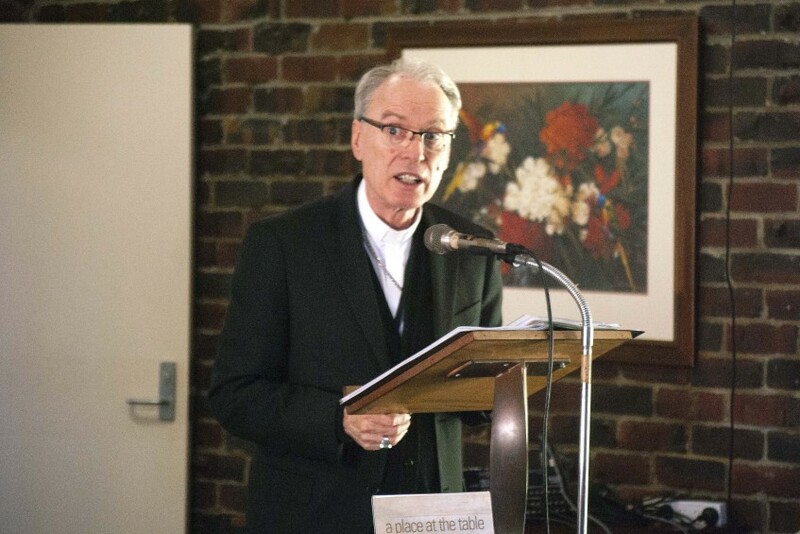 A Place at the Table: Social Justice in an Ageing Society was launched on Tuesday, 20 September in front of an audience of both young and older faces at the Redemptorist Monastery in North Perth, following the national launch earlier this month. The statement highlights the ageing of our population – rightly described as ‘the great success story of human development’ – and the need to support and value older people in Australian life, while fighting the ‘throw-away’ culture that threatens their sanctity and dignity. During his speech for the occasion, Bishop Sproxton shared a personal story, recalling how he moved back in with his father for the last three years that he was able to live independently. As a veteran, his father was entitled to phone care and nursing services, Bishop Sproxton said. He also had regular visits from friends and was able to put his knowledge of military operations during World War II to good use by contributing to a book. “You see, there was a place at the table for Dad,” Bishop Sproxton said. Bishop Sproxton explained that he was very grateful for the support his father received, which maintained his sense of worth and dignity. However, the 2016-2017 Social Justice Statement gave him pause, because this was clearly not the case for all elderly people. “Many of the supports that my dad enjoyed are not available for so many other elderly citizens,” he said. “Homelessness, unemployment, limited retirement savings, especially for women, and the overrepresentation of Aboriginal and Torres Strait Islander people on practically every indicator of social and economic disadvantage are but some of the grave problems that have to be addressed by our society. Bishop Sproxton’s address was followed by a panel discussion facilitated by MercyCare Executive Director for Mission and Culture, Sheryl Carmody, and featuring Advocare CEO, Greg Mahney, and MercyCare Executive Director for Aged Care Services, Carlo Calogero.